This is the first sea fish that I learn to know in my Childhood, as a girl from the rural up country area 600 kilometers away from the Capital. They are considered the most inexpensive sea fish and a common food for the common Thai families. They come both fresh and steamed. 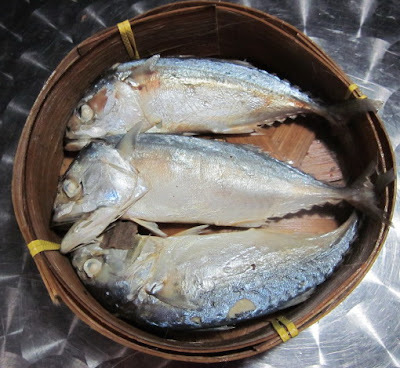 The steamed version is kept for a few days in the fridge and we can make a lot out of this common mackerels. For example we deep fry them and give the meat for the young babies. It’s a good and inexpensive source for Omega3, unlike the salmon with their heavy chemical feeding systems; this fish is a free living sea fish. We use their fried meat to make chili sauce or make a salad out of their meat. The fresh fish could be added in the spicy Tom Yam soup or slowly boil with ginger and other herbs.